Chickens don't fly... like Newton's apple, they'll head straight for the ground. 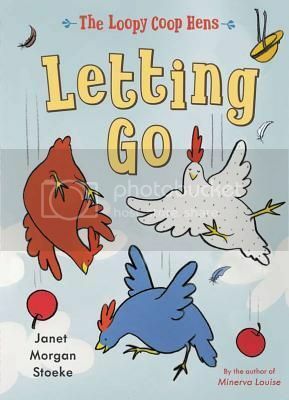 This picture book makes for a fun story for beginning readers, with easy three and four letter words and a repetitive vocabulary. Dot, Pip and Midge are just as charming as the adorably addlepated Minerva Louise from Stoeke's earlier books. The silly chickens are convinced someone must be throwing apples at them - when they finally make their way up into the branches of the tree to investigate they are rewarded with a wonderful view and cheerfully discover that what goes up, must come down. So silly! Adorable Baby Owl (from I'm Not Cute) returns. This time, he's squashed under a boatload of even cuter fluffy baby chicks. This is the book that I didn't know that I needed for preschool storytime. Colorful digital illustrations with soft fluffy edges make Baby Owl look extra cute and huggable. Endpapers feature a plethora of baby chicks. 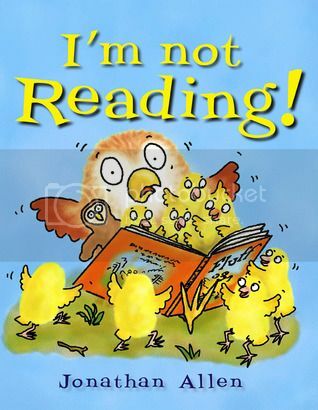 Fortunately, Mama Owl is able to come to the rescue and set everyone to rights so that Baby Owl can finally share his love of reading with everyone. Tiny Bunny is surreal and overly cute. He dreams of all kinds of things (making friends with a dragon, being larger than a forest) but then is super lonely. He awakes to find himself in the company of another bunny. Bright digital illustrations have a glossy sheen. 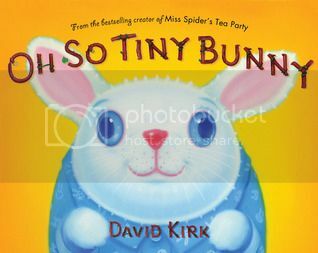 This picture book is sure to be an Easter tie-in favorite, for the colorful bunny cover alone. This would also pair well with other books about making friends. Loose, sweeping watercolors grace this picture book based on African Nkundo folk tale. 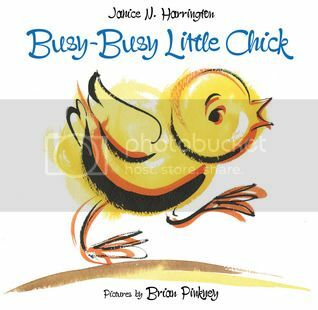 Busy-Busy Little Chick industriously builds the whole family a new home. What a mensch! Because the story is based on the oral tradition, the book begs to be read aloud with repeated onomatopoeic phrases. There's a nice moral to the story - even though Busy-Busy Little Chick's siblings and mother are lazy, he helps them out anyway, it's just the right thing to do.